Photographers are visual artists. With new equipment and technology making the art more affordable, photography has grown to be apart of our every day lives especially with HD quality cameras attached to our smart phones, and cheap-readily-to-use filters like VSCO and AfterLight. Everyone can create a photo with one reach for their phone and the canvas that surrounds them. The beauty is that this allows the photography medium to be extremely approachable and easy to use for absolutely everyone. What we often forget though, with it being so mainstream, is that the person behind the camera (whether amateur or not) is still an artist! As a professional photographer I choose my main artistry platform to be through digital photography. But I still have so many other artistic passions. I went to school for Art History, Desktop Publishing, Photography, AND Fashion Design. I was an OK designer... I more or less loved fashion illustrations, the photoshoots, and publication design/marketing more than actually creating garments itself. I've always loved writing, singing, poetry, and dance. I was always, always, an artist. When I was a toddler I was an avid colouring book fanatic and plastered people near me with stickers and even took to colour my grandfather's feet! Lately, totally unnoticed, I forgot about those early passions. My love for sketching, for painting, for poetry, for dance, for ART! It wasn't until I took a free water-colour class workshop on Periscope with Paige Poppe that my desire to integrate more platforms of creativity really took spark. On Paige's Periscope, we did basic water-colouring and all of a sudden I was running a high fever of creativity! Blog ideas were coming to me, I would spend hours with a pen and paper writing down my creative ideas for my business but also for fun photo projects. Landon and I spent an afternoon in the sun sketching and bouncing ideas off of each other in our backyard oasis. I was finally nourishing the child artist within me. It felt so good, it felt so right... it felt blissful. Today, I woke up as I usually do and made some coffee. I sat on my favourite reading chair while listening to the morning news and pulled out my wisdom oracle cards. I pulled "focus" - focus on a strong intention or desire. In that moment I closed my eyes and realized that what I was feeling was a need for playfulness, inspiration, and fun. So I set the intention for the day to be full of play, and not taking life so seriously. After all, I created my own business so I could allow myself this luxury, to live a life I feel so empowered in and passionate about! So this morning I went to my local craft/art store and picked up some supplies! I grabbed a travel watercolour sketchbook, a new brush, a colourful palette, and some 6x8 mixed media heavy weight cards. What I loved about Paige's podcast is not only her incredible spirit, her naturally soft presence, but also that she worked with small cards or paper! As she put it, and I am totally paraphrasing but - "it makes it less intimidating." Which totally resonated because I always found my previous watercolour sheets to be too large and too intimating to create anything on them. Start small, why didn't I think of that? Let your heart guide you in your creation. It doesn't need to be something large, it can be something simple, something you like to make, something random. I like painting lips and eyes! Random, but I love it and gives me confidence. After completing two really fun and SIMPLE painting, I have now decided to add 30 minutes-60 minutes of creative expression on my daily agenda/to do list. I can either read a book, write a blog post or poetry, paint, dance, sing, or look at art online during that dedicated time. I think it will not only infuse some fun and play in to my daily life, but I also think it will encourage or broaden my horizons as an artist. Let your creative genius be free, don't be afraid to get messy and try new things! Even reach out collaborate or find an accountability partner, someone who would like to join your creative journey. 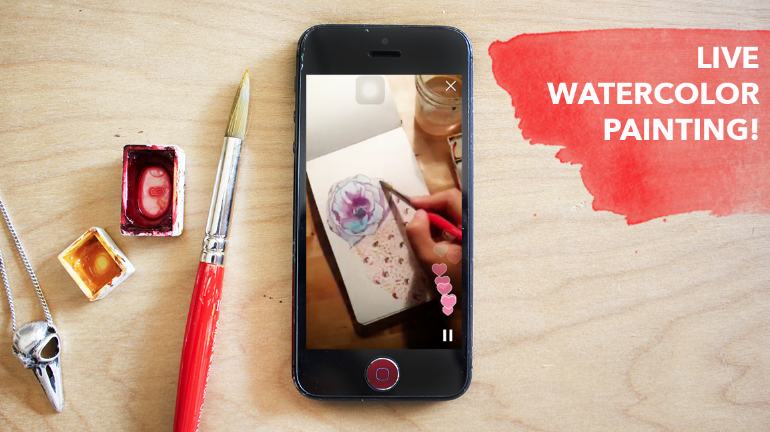 If you would like to take part in one of her FREE water-colour workshops, you are going to need to get PERISCOPE! (ALSO FREE lol) Download the app and add her (@PaigePoppe) and while you are at add me! (@_JamieHyatt). Once she gets 100,000 hearts she will be hosting another FREE workshop so make sure you have your notifications set on! Also, check out her store, she has so many beautiful prints available, custom decks (skateboards/penny-boards), and she does custom pieces! Click on the image below to watch her LIVE watercolour - a replay off of her Periscope. How do you nurture your creative genius? your inner child artist? What is your FAVOURITE medium!? Will you be joining Paige Poppe for her next FREE Watercolour Workshop on Periscope? Please leave your comments below, and also SHARE this blogpost with friends if you feel inspired, excited about creating, or just thought it was plain awesome.